In our last blog, we covered a few ways that you can support the veterans in your community and around the world. While our service members have all been trained to be self-sufficient and courageous in the face of adversity, that doesn’t mean that they don’t need some help every now and then. More than a simple “thank you,” sharing your time and your energy with our veterans is one of the best ways to give back to those who have sacrificed so much for us. In this blog, Patriot Angels will go over a few more ways you can support our veterans. For many veterans, dogs were a regular part of their active service. But dogs can play a crucial role in the long-term health and wellness of a veteran after they’ve left the military. The Mayo Clinic suggests that being near pets, especially ones who have been trained as therapy animals, ease feelings of pain, anxiety, loneliness, and even depression. There are numerous groups that train therapy animals and dogs for service members specifically. In many cases, you can sponsor one of these dogs through monetary or other contributions like food, collars, and bedding. These dogs are sure to bring a sense joy, comfort, and love to their veteran partners. If you travel for business or for play frequently, you’ve likely racked up a lot of frequent flier miles. Rather than use these on your next trip, consider donating them to a veteran or to their family members. The Fisher House Foundation runs the Hero Miles Program, which takes donated frequent flier miles to ensure that family members can visit service members who have been injured or are ill. This allows families to be close together when it matters most and ensures that a veteran is feeling loved and cared for. So far, we’ve offered some pretty great ways to help our veterans, but some of those ways might be outside the means of the average American. But you don’t have to carry out a grandiose act to care for the veterans in your community. Simply volunteering your time and skills in little ways can make a big difference. If there is a wounded veteran in your neighborhood, offer to mow their lawn or care for their landscaping. Bring them a plate of cookies, or share a meal with them. If there’s an active chapter of a veterans group in your town, offer to put a fresh coat of paint on the exterior, or to help out with an upcoming function or event. 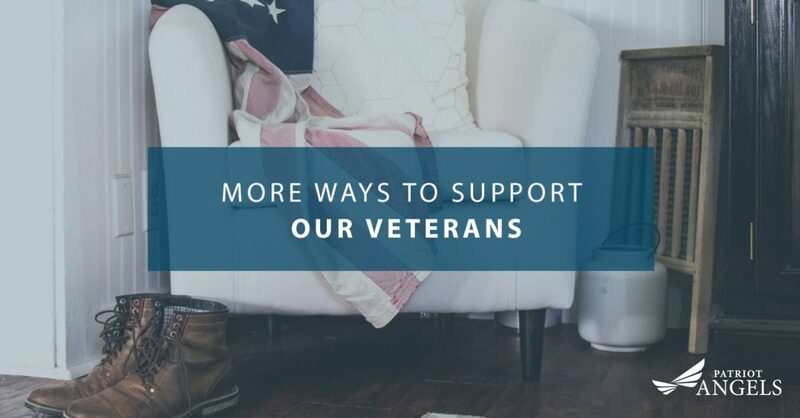 In many cases, these little acts allow you to develop a personal connection and friendship with that veteran, helping them to feel more connected to their home and community. Of course, you can also help our veterans by ensuring they get the long-term care they need. The VA offers a wide variety of programs that do just that, but applying for them can be difficult. If you or a loved one is struggling to decipher the VA Aid and Attendance qualifications process, don’t hesitate to contact Patriot Angels. We can help you secure the care you need. Contact us today.